The LED backlight conversion replaces the fluorescent lamp with LED strips of equilavent brightness and greater reliability. 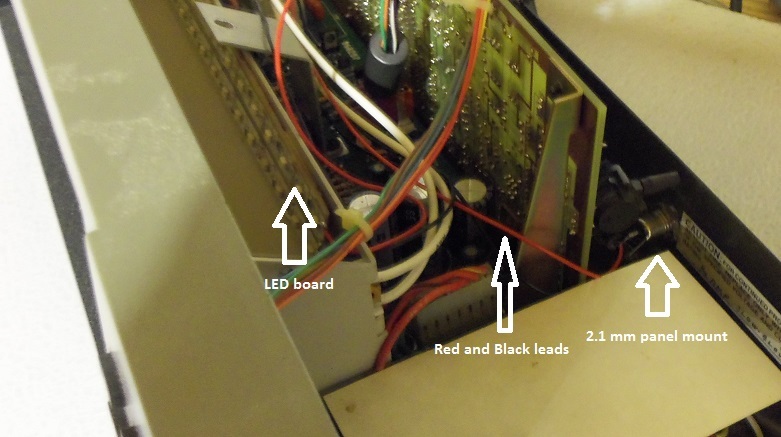 The upgrade process involves disabling the fluorescent circuit on the power supply board, removing fluorescent lamp sockets, building the LED "board", and mounting a socket for a 2.1mm 12VDC power supply plug on the back of chassis. The steps provide sufficient information for the experienced eletronics hobbist. Double-sided foam tape (alternately use hook-and-loop fastener -- e.g., Velcro). Disconnect ID-5001 from the wall power. Remove main cover and lamp cover. Remove the main circuit and power supply boards. 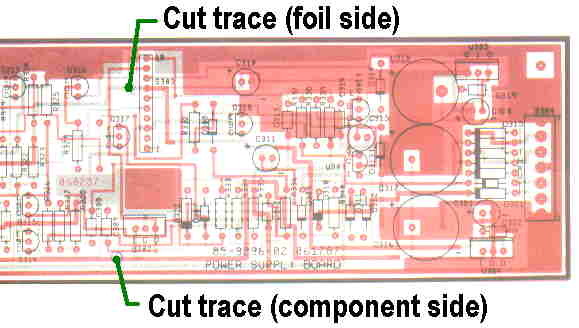 Cut the two traces that supply power to the fluorescent lamp (see Figure 3). Remove the lamp cover plate. Remove fluorescent lamp and lamp sockets. Reinstall the power supply and main circuit boards (see note for step 1 below). Mount the 2.1 mm Power Jack Socket Female Panel Mount Connector to the back of the chassis near where the AC power cord enters. Note: it may be easier to mount the connector prior to reinstalling the power supply and main circuit boards. Prepare 1" by 10" rigid plastic backer. Cut both LED strips to about 10" (cut strip only where indicated by the markings on the strip itself). Remove LED strip backing to expose the adhesive. Affix to the plastic backer. Prepare 10" red and black leads. Remove 1/4" insulation from each end. Solder one end of the red 12" lead to the positive (+) solder point on one end of the first LED strip. Solder one end of the black 12" lead to the negative (-) solder point on one end of the first LED strip. Prepare 2" red and black leads. Remove 1/4" insulation from each end. Solder one end of the 2" red lead to the positive (+) solder point on one end of the second LED strip. Solder the other end of 2" red lead to the same solder point in step 6. Solder one end of the 2" black lead to the negative (-) solder point on one end of the second LED strip. Solder the other end of 2" black lead to the same solder point in step 7. Apply 1" pieces of double-sided foam tape to both ends of the back the plastic backer. Affix the plastic backer to the inside the light chamber in the previous location of the fluorescent bulb. Route the red and black leads through the gap between the sides of the light chamber to the back of the chassis where the female 2.1 mm adpater is mounted and solder the leads. Apply 12VDC to verify light operation. Thunderhead Technologies assumes no responsibly for the accuracy of the ID-5001 LED Backlighting Conversion, availability of its parts, its fitness for any purpose, or any damages - direct or inconsequential - to persons or property. The ID-5001 LED Backlighting Conversion is intended for individuals experienced in electronics assembly. Consult a qualified professional if you are unsure of your ability to perform the required steps. Always follow safe practices while working with electronics including wearing an anti-static wrist strap to avoid damage to any electronic component. Use of any vendors' parts does not constitute an endorsement of that vendor. Note: The LEDs will likely begin to very slowly dim after about 12 months. Replace the LED strips to restore full brightness.